Poor Microsoft — they must be wondering when it’s all going to end. Their browser choice screen was launched on 1 March following costly EU legal shenanigans. Statisticians then reported that the random browser display was not as random as it could be. Now the makers of Avant, Flock, GreenBrowser, Maxthon, Sleipnir and Slim have complained to the EU about the visibility of their browsers. You can see their point — anyone with a smidgen of web design experience knows that horizontal scrolling should generally be avoided. The final Choice Screen design leaves the vast majority of users unaware that there are more than five browsers to choose from. We are only requesting the simple addition of any text or design element, that would indicate to an average user that there are choices to the right of the visible screen. Microsoft has reiterated that the screen was in built in accordance with the European Commission’s demands. In my opinion, no vendor will ever be 100% happy with the screen — even if Microsoft succumb to their wishes. Offering 12 browsers is slightly ridiculous and few novices will appreciate such an overwhelming choice. What’s worse is that several of these applications have been rated as “shockingly low quality” in a recent PC Pro review. With the possible exception of Flock and Sleipner, many users could abandon their new slow and ugly browser, return to IE, and never try another alternative. That’s not what the EU wanted to achieve. 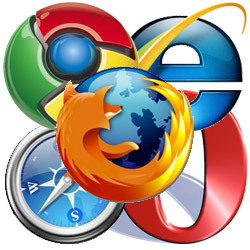 At least the top 5 browsers give users a choice of good-quality software which has been tried and tested by millions. The alternatives may have good points, but they’re less popular for a reason — and they do not offer the same level of support. The horizontal scroll bar may not be good design, but it’s a reasonable compromise between offering everything and keeping the screen simple. I’m not convinced it should change. Are you?